The first stage is the picturesque Glenelg River, which stretches out as it nears the coast then carves its way through a spectacular limestone gorge. Then it is onto the pristine sandy beaches, rocky outcrops and freshwater lakes of Discovery Bay Coastal Park. The grand finale is the Three Capes and Bays section where the track hugs the clifftop all the way. Hike the picturesque Glenelg River section of the Great South West Walk from Moleside Creek to Sapling Creek. The track is by the river most of the way with delightful opportunities to take a dip. Progress through the Glenelg River Gorge and continue to follow the river all the way into the settlement of Nelson. The character of the river changes dramatically through the gorge as it widens nearing the coast. Here you’ll see boat sheds that have been converted into waterfront houses. Spend the morning following the sandy beach of Discovery Bay. For the afternoon, head back onto the track inland, parallel to the coast, emerging at a huge freshwater lake. This can be a moderate to challenging walk at high tide. Begin the Three Capes Section of the track which hugs the cliff the entire way with photo opportunities aplenty. The coast offers blow holes, a “Petrified Forest” and an “Enchanted Walk” where vines of bower spinach are decoratively draped over limestone boulders and twisted moonah trees. Walk in to your accommodation at Bridgewater Bay. 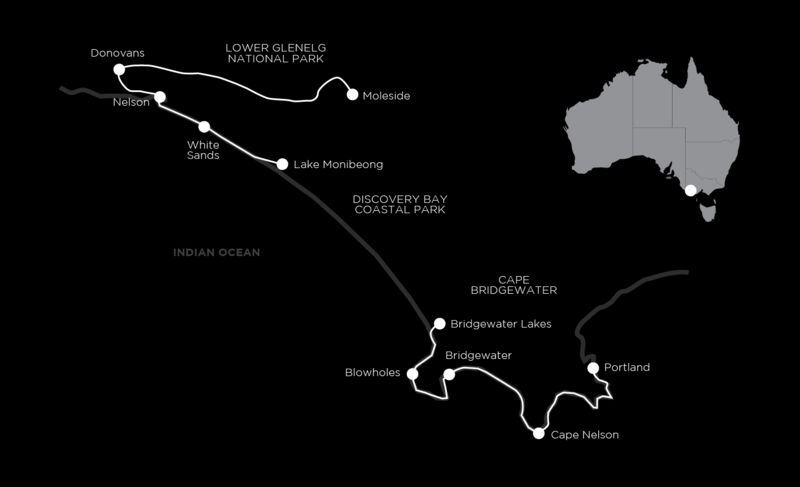 From Bridgewater Bay, the route continues via the beach then clifftop track to Cape Nelson Lighthouse. There’s a cafe here to reward yourself at the end of the hike. The final section of the Great South West Walk continues from Cape Nelson all the way into Portland. Highlights include Yellow Rock, Cape Sir William Grant, an endangered Australasian gannet colony and the Portland Battery. Then it’s back to the B&B in Portland where you can boast about your achievements. Your holiday finishes after breakfast in Portland. These sections of the Great Southwest walk track are well graded and relatively easy to negotiate. Full days walks average about 21km. There are great opportunities for fit walkers to challenge themselves on most days. This supported hike has you walk in and out of remote towns and stay at small bed and breakfasts and lodges. Your hosts Denis, John, Trish and Roger have been part of our team for nearly twenty years and love accommodating and feeding our walkers. The rooms all have ensuites except at Nelson Lodge. Nelson Lodge was an old police station and has real character and it is most likely that you will have the place to yourself. The views from Sea View Lodge at Bridgewater make you feel like you never left the track. We have rated this walk as moderate as some days are quite long. Full day walks average about 22km, 5 to 7.5 hours walking each day. The walking is mostly flat over reasonably well-walked paths, bush tracks and with some sandy sections. Warning about tide times – we may have to be a little flexible with your start date to make sure that the walking on the beach at high tide is avoided.